A New MUSICAL CONCEPT Text written in Rio, 1987. It still defines the professional aim of my life. In The history of the PARADIS guitar sound, you can read more sound philosophy. for me is about all we can see, feel, imagine, all the energies and matter we can perceive and also all we cannot see, feel imagine. I find it useless to discuss whether there is one or several or no God or Saints or Spirits since we do not understand much about it and each person collects its experiences about it and imagines a different system above us. Its as if the ants would kill each other because some believe in the power of the cows and others of the storm. I think God is about as perfect as nature and mankind is. Understand however you want: Perfect. Its root means: made to the end, reached the end, impossible to develop further, dead. My God lives and develops - with our help! If there is something that can represent God to some degree, its the Sun. It has spilled the Earth, holds it close and feeds it with energy. I even suspect there is information in this energy. I spent a long time thinking about whether its male (o sol) or female (die Sonne) and came to the conclusion its both. The moon is important as a timer for the earth, and its amazing that it became almost of the same size as the Sun, but its not the opposite, its much less important. I love to watch Sundown in silence. its the opportunity to look at the strongest thing we can perceive. Each time is different. I call it Gods show. Only after 40 years I realized that the full moon rises when the Sun goes down (the worlds best schools did not teach me this!). I discovered a few places where we can observe this monthly spectacle. It takes some more comprehension of my friends and more from unknown people who often get my return for free... but gives them confidence and clarity about what I want and do. I often hear that I am a good mirror, which is one of the most important functions of friends. In some cases it may be useful to hide some knowledge from others and a wise man might be able to help someone with a lie, but in my experience, sooner or later, the reality comes through, harder. We obviously have some means to exchange energy with the whole of the creation or at least with a much bigger part of it than our visible world. Our organ of communication with this level may be conscience and consciousness (only one word in Portuguese!). Through it, we can consult the creating forces and become aware of the plans and principles that are given to us as law of nature an moral. But its an exchange: In the interest of the whole, we can ask for support for our particular destiny and even discuss the law to improve it. This belief tends to make us stand up or even become arrogant. But to my experience, the most important condition to get inspiration is to keep modest and accept our smallness and thank for the given energy instead of feeling like owners of it. Ideas are free and public and may come to several persons simultaneously. We are owners just of our own work, not of the ideas behind it. Spirits may explain things to us through music. We may learn from the harmony in sound how to harmonize material live. is a very wide idea. I have some talent in leaving people better by talking to them, playing for them, touching them. I am initiated in REIKI, which helped me a lot to apply this talent. The palms are the main port for the curing energy to flow out of our body, but there are infinite other ways. I feel that in music, similar energies flow, or it can help people to connect to the energy themselves. Once we analyse the other persons problem and react with an opinion or remedy, we take over responsibility, because we can never really know what the persons problem is. But the REIKI way of helping is not through knowledge but through good will without personal (egoistic) wish. Then, having contact, we may feel the persons problem. the main resources we deal with every day. Interesting persons never have enough time to do all they are interested in and could help to. It seems that hardly anybody thinks they have enough money either. but most try to invest time for more money and fewer try to buy more time. I am of the last kind. I am 20 years behind with what I should or could do. Although there were not many, I regret the hours I watched TV and sat in bars yelling small talk. I also should have spent less time to search for the cheapest outlet and spent more time doing without some of the "time saving devices". They are fascinating and thus often take more time than they save. While time and money are extremely precious to achieve and enjoy, too much of them (as of anything) is dangerous. It takes responsibility to deal with them. I prefer not to be radical and try everything. Radical vegetarians shock people instead of being a good example. But it IS very important that we eat less meat, to save the land and rainforest and to preserve our tranquility! Once or twice a week is ok. I create my own bread and jam, make my muesli every day out of the marvelous fruits that grow in Brazil and eat full rice and beans (or lentils) and salad in the evening. I avoid cans, white sugar and alcohol. If somebody invites me for meat, I eat it (except unknown chicken). I love tuna fish and find it a crime to be canned. I clean water and salad and some fruits with ozone. are the group of people I have the easiest contact with. I share their rhythm of live in many respects (I sleep from 4 to 12 AM and never dress a tie :-). Without the contact to them, I would not know about music and about all the various stages and the variety of creation I am interfering with my developments. Usually I develop first what I want and then show it to musicians to expand and adapt to common needs. 1984-86 I stopped listening to music of others and inserted tapes of my own fresh LiveLooping music wherever I went. Are the good place to meet musicians, experience music, inspiration and technical needs and failures. I visited stages during 20 years to perform and experiment my ways of sonorization and to assist and support others as a sound engineer. I observed that usually a lot of quality is lost by the too big quantity of speakers spread. All want to be on the save side and spend space, sound quality (phase confusions) and money just for this security while I hardly ever see a concert that fails because the music is not load enough. Is a very delicate job, between the musician, the public and the production. Its not just reproducing what the musicians play. It means to understand and enhance the principles of their music and the understanding of the public. Production can help a lot in this process or kill it with standardized ideas about what the public likes. An interesting way to meet expectations is to mix dynamically, showing a bit of everything during some time. An instrument may be shown when it comes up and then overridden by others, because the listener recognized the instrument and will continue to hear it even if its almost or totally inaudible. To connect and control technology so it serves the process, appearing as little as possible. To control quality of the recording and playing, including noises, mistunings.Some very good musicians do not have an analytic hearing for sound quality but deserve respect anyway. Advise the artist about the technical tools and options so he can profit and define the most accurate possible how he wants his creation. Add details that the musician may find unimportant or is incapable to perceive in his music - in the sense of the musician or the spirits that guided him. Diplomatic contact with the music to be able to correct too crazy ideas or spontaneous bad taste without touching him too much. Even the arrangement might have to be changed in order to follow the laws of acoustics. Can be done by constant listening. Playing to what is heard makes concentration and understanding simpler. Musicians tend to concentrate rather on the melody and rhythms and disrespect the sound details. Some even think that they are better or more modest if they do this. Some technicians have a tremendously developed hearing. I fully admire them but think that we should not invest much more into improving fidelity in sound reproduction but rather into turning equipment and processes more handy and according to musicians and listeners need. I find it more important to be able to listen like a listener than to hear all those details that everyone else is unable to perceive. Are the base for this work just like for any other. I do not use any math in none of my works. Sometimes I look up a formula and I am grateful for all those engineers that make the effort to create exact and small and complex chips and schematic principles so I can just look them up and modify and put into my creations. I constantly have to care for the laws about sound to understand what I am doing and why something may sound good. Basic for me is that bigger means slower means lower pitch means higher amplitude. Just compare pitch, movement, volume and food consume of different animals and dead matter. Sure, you find exceptions. What nature offers may not always be best for us. Culture means improvement and adoption of nature to our needs. So it makes sense to improve natural spaces and instruments with acoustic and electric filters and create electric instruments that do not need resonance's to become audible. I especially like synthetic reverb, the creation of unreal space that we are able to experience by ear much better than by eye. I often mix with just one reverb for all instruments: Put all the music into the same space to make it melt together. - Dominant: One component calls attention, the others are there to support the dominant component. - Hard: All components appear clearly separable with about equal importance. - Soft: All components melt together to form one new, unknown one. is what I studied the least and makes me often feel incompetent as a musician but then again its impressive how resistant I am against learning this matter the rational way. I have seen to many musicians basing too much on "correct" playing instead of "right" (inspired?) playing. Our perception of harmony comes from the natural overtones, the multiples of a basic note. Therefore, in the bass range, intervals shall be simple (big) and in the high range we can understand and like very small intervals and pitch details. The rhythmic world is related, about 1000 times slower than sound vibrations. I discovered that machines have something like a should and depend on our emotions. We can relate to them as companions, dominate the to some degree (like a dog or horse) but need to respect them and give the minimum of attention, otherwise they break, get robbed or simply sound bad. About half of my clients came with machines that did not really have a problem. Often the clients themselves could not explain what the problem was and were amazed that the machines they hated worked on my table, just like a patient that stops being sick when confronted with the scalpel. I think that good sounding instruments have a healing effect first on their players and then on the public, independent of the interpretation. 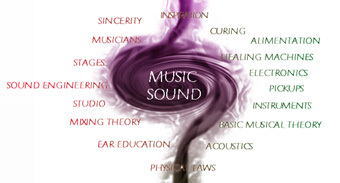 Pure harmonic sound heals. So machines that create this sound end up being Healing Machines.